What does a prison break, Queen Victoria, and Australia have to do with St. Patrick’s Day in New Bedford? The answer lies in a thrilling 1876 escape from a remote Australian prison involving six Irish Nationalists, a secret agent, a rowboat and a fearless sea captain. Sarah Rose, Curator of Education at the New Bedford Whaling Museum, shared the story with me. Rose recently went to Ireland to set up an exchange between the Museum and Irish high school students. In the late 1860s, the British Empire convicted a number of British soldiers to death for treason for having joined the Irish National Brotherhood (they were referred to as Fenians). Queen Victoria commuted their death sentence to a life of hard labor in a remote Western Australian prison. Fremantle Prison was a place as infamous as Alcatraz, impossible to escape, with desert to the east, shark infested waters to the west, and long days of back-breaking labor. The Fremantle prisoners reached out for help to John Devoy, a fellow Fenian who had been exiled to the United States. Devoy raised funds, bought a whaling ship named the Catalpa, and persuaded an American captain, George Anthony, to attempt to rescue them by sea. It was a crazy idea. One which depended on over a year of planning and plenty of luck. Captain Anthony embarked on the Catalpa under the guise of a whaling expedition. Meanwhile, James Breslin, an Irish nationalist posing as an American millionaire, was able to gain entry into the prison by feigning interest in cheap labor and investment opportunities in Fremantle. Breslin got word to the inmates that they must ALL be outside on Easter Monday 1876 if they were to be rescued. There would not be any second chances for anyone left behind. At the appointed time, all six men were outside. Breslin arrived and spirited them away by horses twelve miles down the coast where a rowboat and Captain Anthony waited for them. They rowed with all their might for the whaling ship which waited a few miles out — just beyond the point where international waters began. But their escape was discovered and the alarms sounded just as they were beginning to row. For two days, the men rowed heroically. They survived an intense gale which broke the boat’s mast and a police cutter bearing down on them. Meanwhile, back at the Catalpa, the first mate was being harassed by an imposing British steamer, the SS Georgette, which had been commandeered by the Australian governor to thwart the escape plan. The Georgette’s captain demanded to board the Catalpa. The Catalpa’s first mate refused entry. The stalemate ended when the British steamer was forced to turn back for more fuel. The Georgette returned the next day, refueled and heavily armed for combat, after the prisoners had finally reached the boat following a last minute chase by the police cutter. The Georgette came menacingly close to the whale ship and threatened to fire upon the Catalpa. Captain Anthony raised the American flag and dared the British ship to fire, declaring that an attack on the Catalpa in international waters would be considered an act of war against the United States. 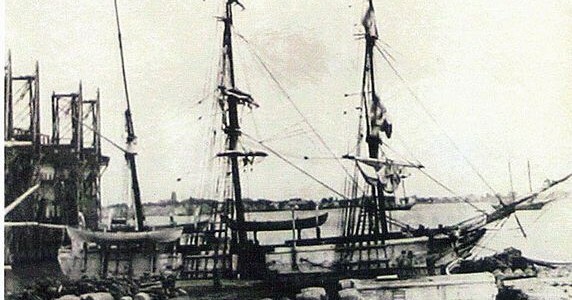 But with no available wind, the Catalpa was unable to sail away and the Georgette attempted to maneuver the Catalpa into Australian waters so that it could fire upon the American ship with impunity. Fortuitously, the wind picked up and the Catalpa sailed away. When the ship entered New York harbor five months later, hundreds of thousands of people greeted the Fremantle Six. Their daring prison rescue was an international story and the Irish fight for independence was reinvigorated. It’s a story definitely worthy of a swashbuckling Hollywood movie. For more background, check out Smithsonian Magazine or a PBS episode about the event, Irish Escape. Even better, go to the New Bedford Whaling Museum next fall to check out “Friends, Famine and Fenians” in celebration of the 100th anniversary of the 1916 Easter Rising. Word is that the original flag from the Catalpa may be there. And to bring it all around to our original question: what does all this have to do with St. Patrick’s Day in New Bedford? The brave whaling captain who led the expedition and boldly dared the British Navy to fire upon his ship was — you guessed it — a New Bedford guy sailing a New Bedford ship out of New Bedford Harbor. Unfortunately, Captain Anthony’s career as a whaling captain was cut short as a result of the incident because the British Navy threatened to arrest him if they found him in international waters again. 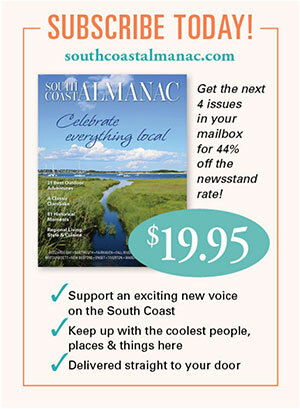 Happy St. Patrick’s Day from South Coast Almanac! This entry was posted in History, St. Patrick's Day, Uncategorized and tagged in catalpa, fenians, fremantle six, george anthony, irish, new bedford. « An online South Coast book group?